What’s your favorite food? 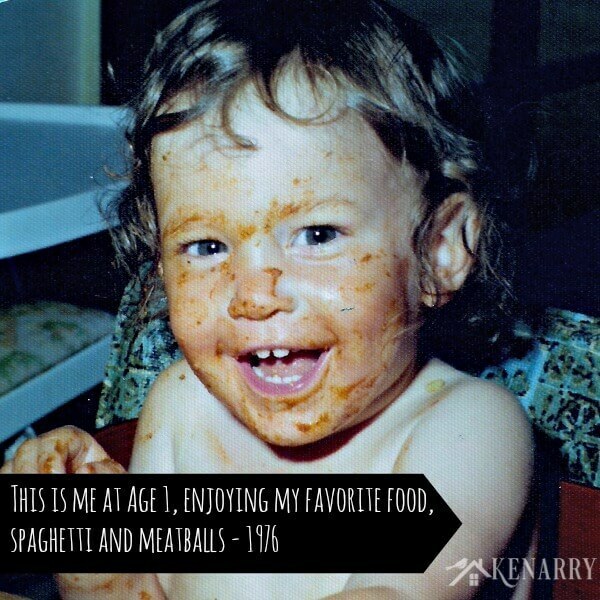 For me, hands down, it’s my mom’s spaghetti and meatballs. Today I’m sharing how to make meatballs with easy to follow instructions that I learned from her. 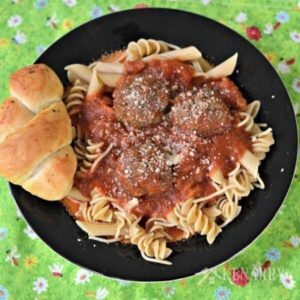 Using this old family recipe she passed down to me, you can create the best homemade meatballs to enjoy now or freeze for later. I love celebrating birthdays. This year is no exception even though this month I’m reaching the grand milestone of forty years old. Growing up, it was always a tradition in my family that you got to pick the dinner on your birthday. For nearly all of my 40 years, I’ve picked the same thing – my mother’s spaghetti with the very best homemade meatballs. When I reached adulthood and started to learn to cook, I had several recipes I couldn’t wait to have my parents teach me. Top on my list, of course, was learning how to make meatballs from my mom. 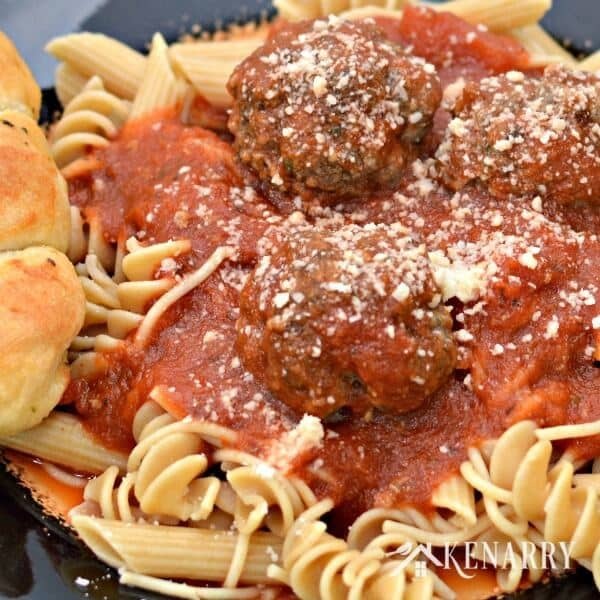 She says she learned how to make these amazing meatballs from her aunt who was Italian. Unfortunately, her recipe is one of those she has in her head and just sort of knows how to throw together quickly by sight. Or in her case, she usually tells me she knows she has the right meatball mix by the smell! It must be all that delicious parmesan, garlic and parsley she packs into these tasty morsels. It took me the longest time to finally get my mom to help me figure out and document the proportions she actually uses in the homemade meatball recipe. It took a lot of trial and error. It actually felt like that episode on Everybody Loves Raymond where Ray wants his mom to teach his wife, Debra, how to make meatballs, his favorite dinner. 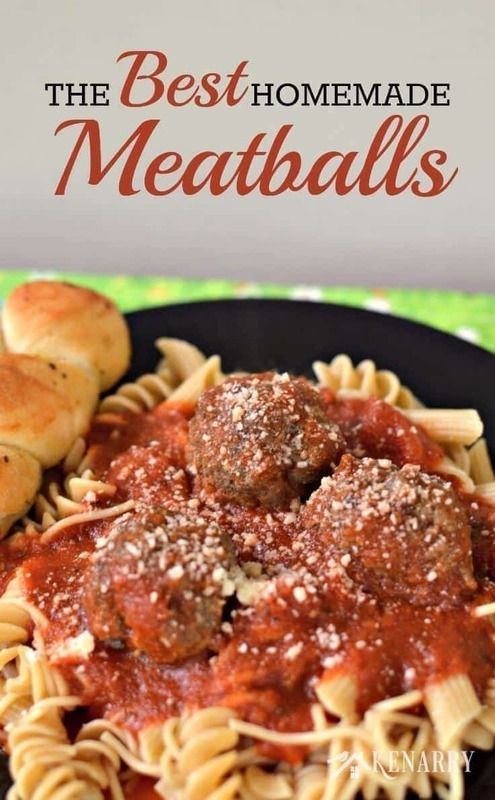 Spaghetti and meatballs is his mother’s specialty, but she keeps leaving out one secret ingredient when she teaches Debra so that the wife’s meatballs are never quite as good as her own. I finally cracked the code, though, and figured out all of my mother’s secrets for the best homemade meatballs. The key is really the quantity of parmesan. This recipe makes a large batch to serve a hearty birthday feast or to stock some away in the freezer to enjoy in the months to come. 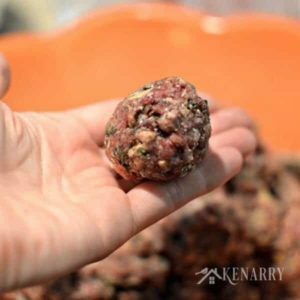 Guide to making super tasty meatballs! 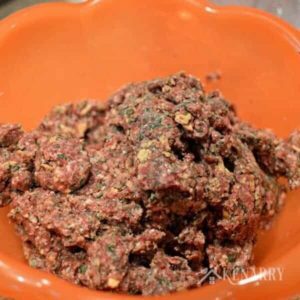 Place ground beef in a large bowl. Add eggs, parmesan cheese, parsley, oregano, garlic powder, black pepper and salt. Top with crushed saltine cracker crumbs. Mix all the ingredients together until it's thoroughly combined. 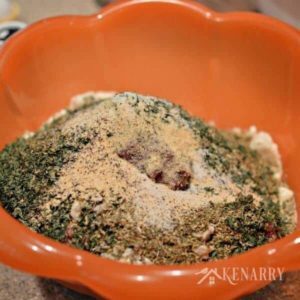 Roll the beef mixture into a large ball by hand. Each meatball should be about 1 1/2 inches in diameter, like the size of a golf ball. 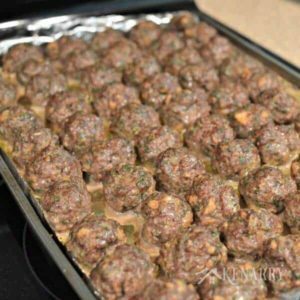 Place meatballs on a lightly greased cookie sheet about a half inch apart. To help clean up, I'd suggest lining the pan with aluminum foil. Bake at 350 degrees for 30 minutes until they're brown. Add to your favorite spaghetti sauce and serve immediately over pasta. When mixing the ingredients to make meatballs, my mom taught me just to use my clean hands to combine everything well. You’ll need to get your hands dirty to roll the meatballs anyway. Just be sure to remove any rings. You could also wear latex gloves if you prefer. This recipe makes a very large batch. 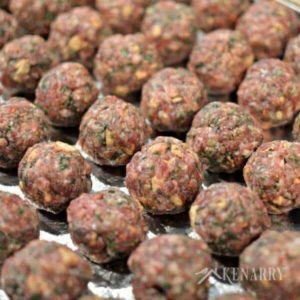 After baking, you can allow some meatballs to cool and then freeze them to enjoy later. Meatballs can either be frozen individually or in spaghetti sauce. Frozen meatballs can be placed in a slow cooker early in the day. Cover them with a jar of spaghetti sauce and allow the homemade meatballs to cook on low for 5-6 hours. 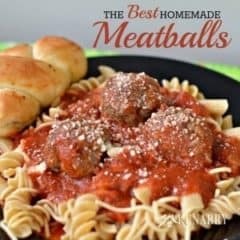 Whenever I make this homemade meatball recipe, I also make some into smaller meatballs, about 3/4 inch in diameter to put in soups and other recipes. What’s your favorite food to have on your birthday? Please leave a comment and tell me all about it. We’re always looking for new ideas and would love to hear what foods you crave when your birthday rolls around. Second, I love this recipe and will definitely try it. I haven’t baked the meatballs before and adore the idea of not standing at the stove with them. Thank you so much for sharing! Hope your 40th is grand! Great recipe to make for freezer. The meatballs are great in the freezer, Faye! Thanks for stopping by. I’ve been searching for a great Italian meatball recipe for a while, so I hope this one does the trick. Thanks for sharing. I hope you love it as much as I do, Betty. Let me know how they turn out. Carrie, these look amazing. My husband really hates spaghetti, but I’m dying for some good spaghetti and meatballs. I’ve pinned this recipe and maybe will have to host a girls’ night or something so I can have people to cook for who will be excited for the recipe. And, you know, so I can eat some too. Thanks. Thanks, Julie! They are my absolute favorite. If your husband hates spaghetti, though, these meatballs would be every bit as amazing served on sub buns and topped with melted mozzarella. Enjoy! I love homemade meatballs! They are one of my favorite things to eat — with a great marinara sauce and parm cheese. Yum!! I’m going to try your recipe this week. Visiting from SITS. Thanks for sharing your recipe at the Inspiration Spotlight party! Pinned & shared hope you have a great rest of you week. Looking forward to seeing your next project/ recipe. Hi Theresa, thanks for coming from the Inspiration Spotlight party to check out the meatballs!